NFL Draft OYOs are gone, and here are the numbers! OYO fans spoke…and we listened! Our 2017 NFL First Round Draft Pick minifigures were released on Day 1 of the NFL draft on April 27th, 2017. Customers and fans reached out to us over the past year asking for the return of draft pick minifigures…and we obliged! On May 8th, these limited-print figures were retired to the OYO vault never-to-be-seen again. That’s only 12 days that these NFL superstars of tomorrow were available in their #1 jerseys to the public before being gone for good. From overall first pick Myles Garrett to the surprise pick of the draft, quarterback Mitch Trubisky, we made 15 draft players that are collectible “First OYOs” of a draft class that is sure to have some star power. Think of these initial launches as their “Rookie OYOs”. 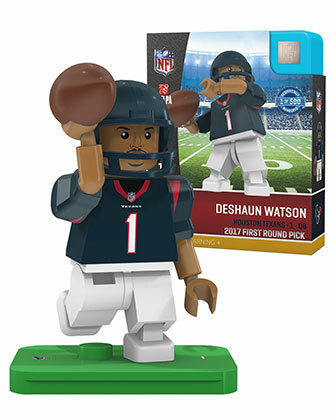 A collector’s item of minifigures who have no ceiling as far as what their NFL careers could be like. As we keep telling you guys…these minifigures don’t last long and are sure to be a collectible rarity that are sought out by minifigures fans! Check out the list here. Happy Hunting! Check the prices realized section for recent sales of these minifigures, here are a few. Thanks for the interest – we will look to add him!